This post goes in my deviants category, as it is about someone who I believe has made an important but correctable mistake, who could know better, and who therefore deserves to be called out and reproved, so they might act better in the future. Obama’s BRAIN (Brain Research through Advancing Innovative Neurotechnologies) Initiative, announced today, concerns what is arguably the most important scientific project we humans are doing today: figuring out how higher biological intelligence works, by exploring and mapping it in living and preserved brains all relevant resolutions. Neuroscientists have developed powerful new mapping tools and software in two main categories. 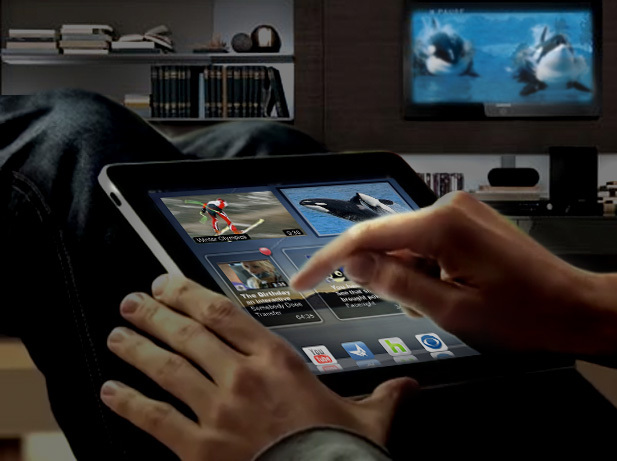 Functional connectomics (also called Brain Activity Maps) is the process of mapping synaptic connectivity and neural activity to biological function, including memory, in living brains. To make these maps we have new tools for monitoring neural action in vivo at molecular, cellular and circuit levels, like optogenetics, calcium imaging, nanoparticle sensors, and other clever advances. Structural connectomics (also called just Connectomics Maps) is the process of mapping synaptic, cellular, and nuclear (epigenetic) information in chemically preserved, nonliving brains (worms, flies, snails, zebrafish, mice, monkeys, humans, etc. ), as a path to figuring out function. There are also new tools and software for the automated slicing, scanning, and mapping of synaptic connections. It was observation of the rapid advances in these areas that led led Ken Hayworth and I to co-found the Brain Preservation Foundation in 2010. The new idea is that combining these two forms of brain mapping may finally allow us to uncover the neural coding system, the ways networks of neurons store short and long term information in their association patterns and strengths. The paper that launched the Brain Activity Map proposal is The Brain Activity Map Project and the Challenge of Functional Connectomics, Alvisatros et.al., Neuron 74, June 21, 2012 (5 pp). It’s a great intro to the exciting promise of this field, and a call to action. Wikipedia has no page yet on functional connectomics (perhaps a neuroscientist will start one) but they do have a page now on the BRAIN Initiative. There are many potential benefits to functional and structural connectomics for science and medicine, but their greatest promise, in my opinion, is that they will accelerate our ability to build intelligence in our much faster and eventually far more capable electronic systems. Some of the brain’s circuit structure and function will turn out to be highly similar from brain to brain (developmental) and some will be unpredictably different (sometimes called “evolutionary” or “Darwinian” differences). Understanding the developmental parts of the brain, and how they constrain and enable the evolutionary parts, will get us much farther down the road of building self-improving artificial intelligences. Activity and connectomics maps, and a few other new tools for monitoring neural activity at molecular scale will of course provide many medical and neuroscientific benefits, and these can be sold most easily to the general public, but the intelligence benefit for science and society, via advances in computational neuroscience and machine learning may quickly become the most important for us. Obama hinted in his State of the Union address in February that he wanted to see America’s brain-mapping and related neuroscience efforts “reach level of research and development not seen since the height of the Space Race.” Science writer John Markoff, in a great NYT article Feb 17th, summarized the views of the founding scientists behind the Brain Activity Map proposal, that funding on the order of $3B, or $300M/year, should be publicly committed to this project. That would make it less than the $3.8B we spent on the Human Genome Project from 1998-2003, an investment which returned, according to a 2011 Battelle report, $796B in new economic activity between 1998 and 2010. A return on investment of greater than 200, one of those rare ROIs you see when opening up an entirely new field. Functional and Structural Connectomics promises to have that same kind of fundamental impact, opening up neuroscience and bringing all the benefits of understanding natural intelligent systems to the technology world. In addition, understanding how the brain uses connectionist features like redundancy and neuroplasticity to protect its critical functions would be huge advances for medical science and therapy. 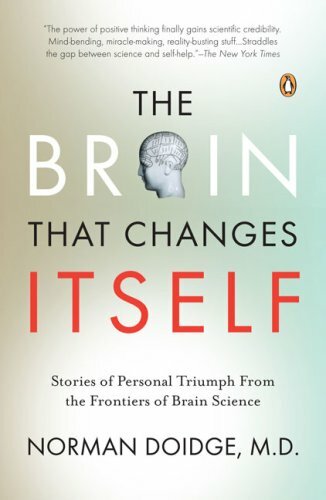 I recommend reading Norman Doidge, in The Brain that Changes Itself, 2007, for fantastic and motivating examples of how resilient our brains can be to memory loss and damage. Unfortunately, in his announcement today President Obama has committed just $100M to the project for its first year budget. And the money committed so far is a hodge-podge that is not project or map focused. Consider that Europe’s Human Brain Project just got $1.3B committed from the EU for the next ten years, even though that project is doing far more theoretical, lower-resolution simulation work that will be highly likely to have a much poorer payoff, in a world where we haven’t yet cracked the static and dynamic neural coding algorithms. Yes, the Human Genome Project started with the same small seed funding of around $100M the first year. But that was when genomics was untested, proteomics a dream, and understanding and mapping the brain still largely unreachable. We’re way beyond those early days now. We know how important maps are, and that we have tools available to make them, and the data sciences folks and hardware to analyze all the new public domain data that will result. It’s time to match real funds with the rhetoric. As I said, the scientists involved in the BRAIN initiative know we’ll need at least $3B to make major discoveries with activity maps alone, and this doesn’t even include connectomics maps, which deserve a few billion as well, if we really want to figure out the neural coding language in any complex animal (say, a fly, or perhaps an Etruscan shrew, a mammal with only 1 million neurons). $5B is not a lot of money for the incredible intellectual advances we can expect. To put this in perspective, we are presently spending $85 billion per month on QE3. Obama cobbled this $100M together by redirecting existing funds in NIH, DARPA, and NSF budgets, so it isn’t even new money, it’s just reclassified R&D. An NIH working group has been designated to develop a multi-year plan with cost estimates by June 2014, and Obama has fast tracked the group by asking for an interim report by fall 2013. 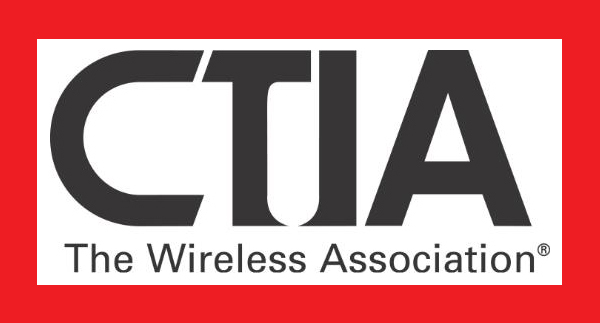 But its still quite unclear what the goals of the project are, and whether connectomics maps will even play a role. If they pass on funding synapse-level connectomics maps, that will be a major failure of nerve. Isn’t $100M a great start for Year 1? Not in my book. What would have been commendable, for a project with this magnitude of potential benefit, would have been starting with a level of finding that is ten times more, or at least a billion dollars up front, and a commitment to seek at least a billion a year for the next ten years. That’s enough to influence students to enter into this field, and would place this project in the light it deserves – one of the best science projects we could work on at this unique point in human history. We should and can demand a lot more from this second term president, particularly one who understands science and tech the way he does. Obama has committed to a commission to study the bioethical issues that might emerge (a concession to conservatives perhaps), but so far his “dream team” of 15 neuroscientists have not committed to connectomics maps, as far as I’ve read. Perhaps they will, but given the vagueness of today’s announcement, it’s quite possible we we’ll see something better in the future. But this isn’t the kind of start that inspires confidence. Ultimately, as readers of this blog know, whether second-term American politicians have the courage to say it publicly or not yet, smarter machines, even more than adding more 20th century-style jobs, have become the primary wealth creator in the developed world, so that’s where our thoughts should go first, as we look for ways to improve our lot. I think it’s time we got serious as a species about realizing what kind of progress the universe has engaged us in. We are here to use our wits and works to become something greater than ourselves. Our highest role appears to be to take what the universe has done with us and make something even smarter, more ethical, more productive, and more resilient as our progeny. This is what civilization has been about, since the birth of technology, as I see it. Want to let the Obama administration know your thoughts on making Brain Mapping, including connectomics maps, a top funding priority? You can send a brief email to the White House by using this form, as I have. Thanks. A “clarified” mouse brain at right (lipids removed, all else stays in place). Transparent to optical microscopy, all proteins, receptors, RNAs can be repetitively interrogated with molecular probes. Amazing! And yet Obama’s team still proposed just $100M in funding for brain mapping for the first year. That’s simply ridiculous. Please, America, wake up! It’s time to spend some real money on neuroscience and bust humanity out of its ignorance. Stop being scared of how much better things will soon be, once we’ve cracked the riddles of neural information processing. Someone also needs to give Deisseroth a serious prize or two. 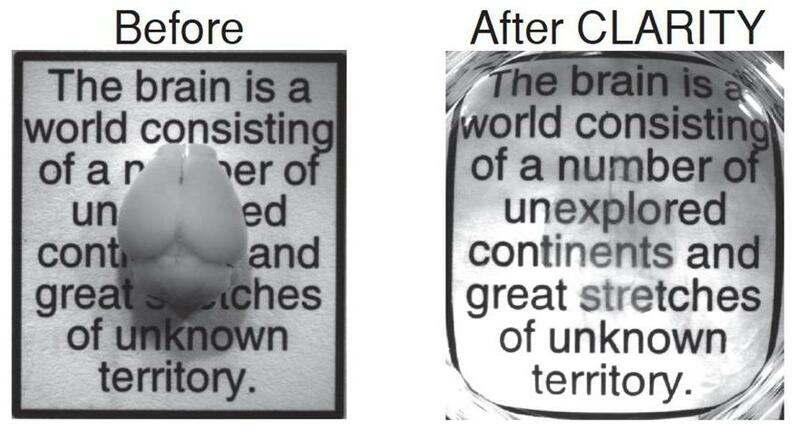 Optogenetics and CLARITY, both out of his lab, are each profoundly important biological sciences breakthroughs. DARPA will spend their chunk of the funds (half of the money we’ve committed so far to the initiative, $70M over five years, which is peanuts, as I’ve said before) on a very-low-yield clinical project (deep brain monitoring and stimulation) vs a multipronged effort to improve human brain structural and functional connectomics (circuit tracing, electrical activity mapping, optogenetics, nanosensors). The potential for brain mapping as the #1 focus of the initiative is gone, mere months after they announced it. 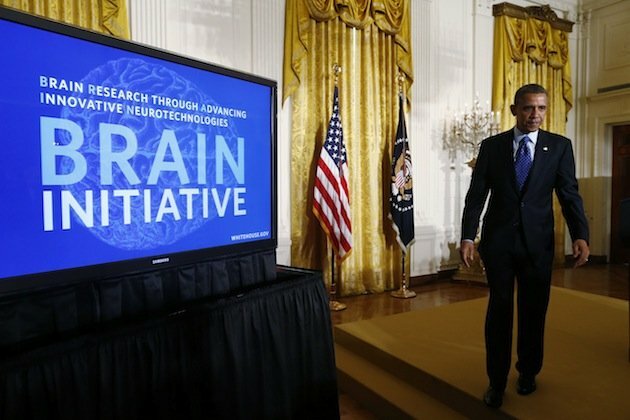 Apparently Obama got the wrong partners (DARPA, NSF, NIH) together for his BRAIN initiative. The 2012 Brain Activity Map proposal that Alvisatros, Church and others made to the White House was all about functional connectomics. This has now taken a back seat to deep brain stimulation and monitoring experiments. Drats! I like DARPA, but I’m sure that initiative mostly won’t work, without functional maps, and I’m not even a neuroscientist. But DARPA likes clinical work with near-term potential benefit (or at least the potential promise of it). It would have taken a firm hand to keep them focused on Brain Mapping, which is the real prize accessible to science, at this stage of our collective technical abilities (more accurately, ineptitude) when it comes to the brain. That leadership is missing today. We need a lot more money, at least a billion dollars a year, devoted to funding the Basic Science of structural and functional Brain Maps, not these expensive clinical junkets. How else can we solve the memory code, and thereby understand how neural nets actually work, and thus make better AIs? Or, as my friend Steve Coles, MD, PhD says, what is the genetic reason why we humans have a Broca’s area and chimps don’t? What is the connectomics of higher intelligence? All most future-important questions about human, social, and machine intelligence are dependent on better brain maps. Ken Hayworth and I started the Brain Preservation Foundation (http://www.brainpreservation.org) in 2010 with the realization that these maps are coming, and will greatly improve our understanding of who we are, and what we can do with our memories and identities after biological death. One fine day we can expect a real Human Brain Mapping initiative, one that really does greatly improve our collective understanding of the brain, for all humanity, for all time. Just like the Human Genome Project uncovered the epigenome and illuminated the proteome, and now we need Human Epigenome and Proteome Projects, which also haven’t materialized, because we are so broke and unmotivated to do Big Life Science. The world needs Brain Maps, Epigenome Maps and Proteome Maps as the new science moonshots for the next five to ten years. These would be completed under budget and under time with more powerful computers than we expected, just like the HGP was. Vote for scientific and technical leadership in 2016, irrespective of party. It’s high time we get some representatives who see, sooner or later, how extraordinary humanity’s future will be. Sooner would be nice, eh?